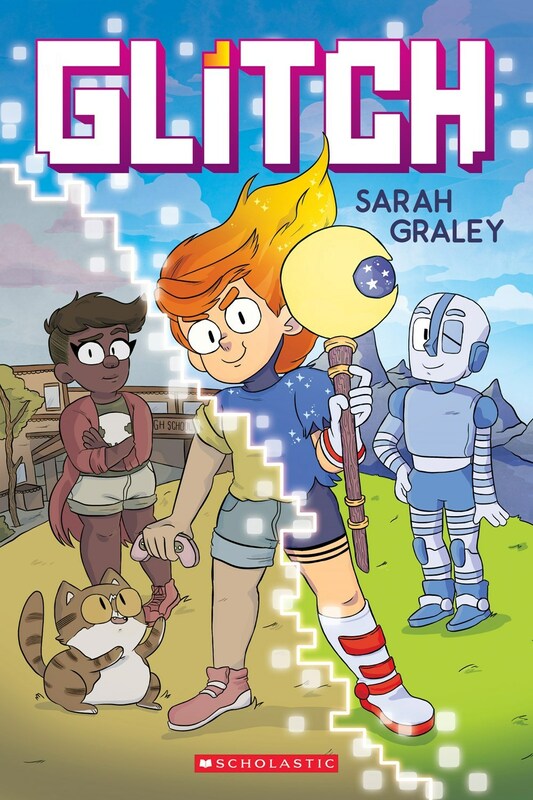 My debut middle-grade graphic novel Glitch is released through Scholastic Graphix in less than a month! Here’s some information about the release and cool places to pre-order it from! 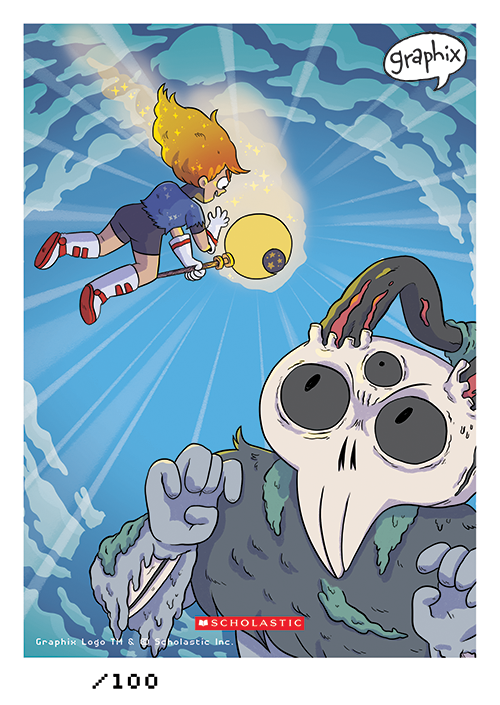 Glitch is a book all about Izzy, a normal kid who is excited for a new video game to arrive! She’s excited to play Dungeon City with her best friend Eric at their video game sleepover at the weekend, but when the game arrives early, she can’t help but - ahem - check that the game works? From that point onwards, Izzy has to try and balance her real life with her virtual one as video game destinies and fighting evil monsters start to take over! Can Izzy figure out how to save the world of Dungeon City AND her IRL friendships at the same time? Glitch is released everywhere on the 14th May 2019! I’ll be doing a signing tour of Travelling Man stores in the UK on the week of release, and I’ve also teamed up with some cool comic shops in the UK to offer some exclusive signed bookplates too! First up, I’ll be at all four Travelling Man stores in the north of the UK on Saturday 18th and Sunday 19th May! You’ll be able to get an exclusive signed bookplate with copies of the book at Travelling Man stores, and I’ll also have some cool little Izzy enamel pins to give away with purchases of the book at these signings! Here’s the Travelling Man bookplate in all it’s glory! Travelling Man bookplate, signed and limited to 200 across four stores! 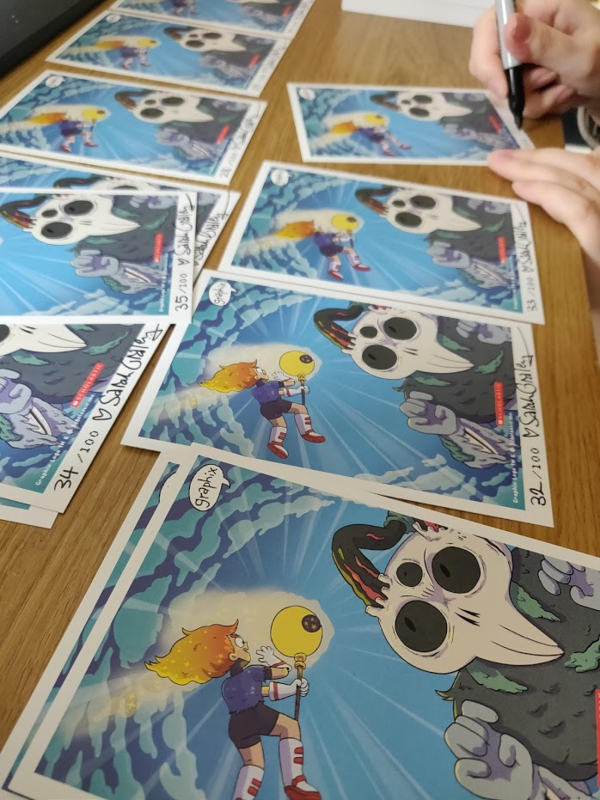 I’m also super excited to announce that Gosh Comics in London and Page 45 in Nottingham will also have their own exclusive signed bookplates! Here are those designs and also some pre-order links, too! Gosh Comics Bookplate, signed and limited to 100! Page 45 Bookplate, signed and limited to 100! Bonus photo of me signing these ones! 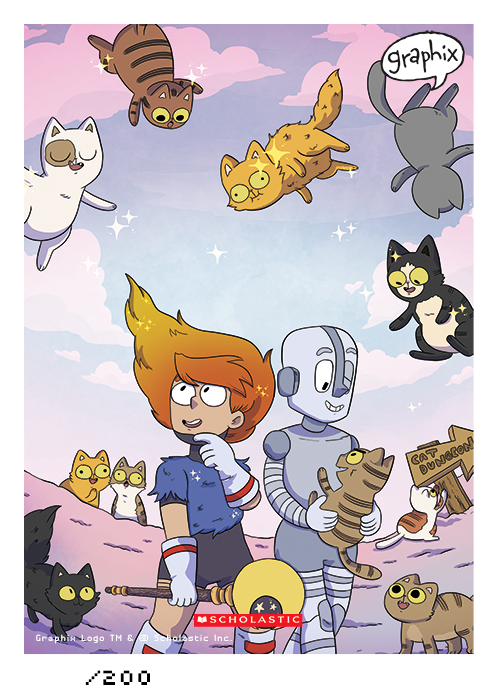 I’ll have news on some more bookplates soon, including a fun one that we’ll have at UK conventions this year! More news on that soon! Lastly, you can pre-order Glitch from a whole bunch of places, and it really helps me out a lot! 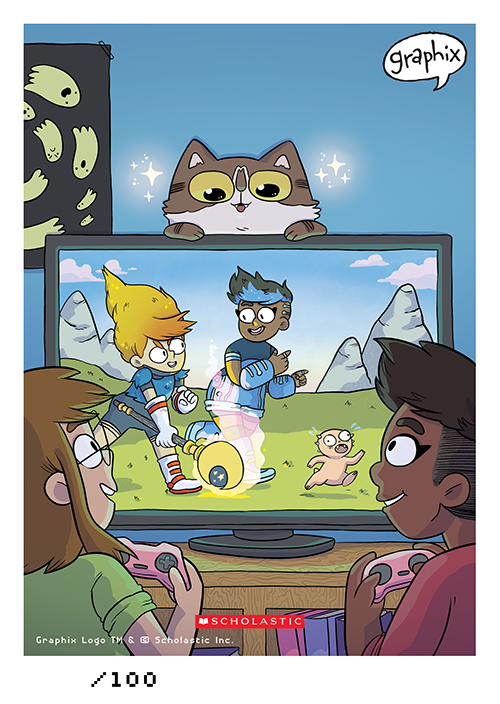 You can preorder it from your local comic or book shop, or from online places like Amazon, Barnes and Noble, and a bunch more places that you can find here! Hiya! 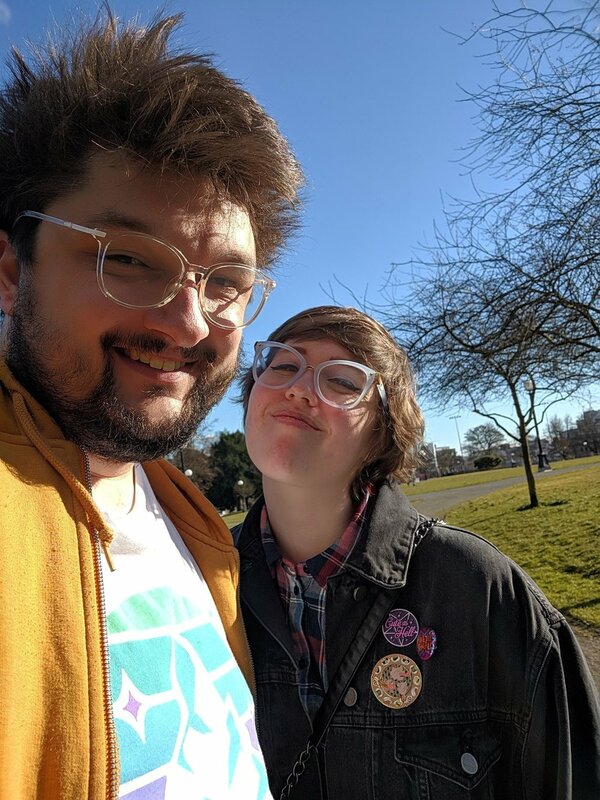 I thought it would be nice to chronicle some of the stuff we got up to in Seattle so here’s a big blog post recapping the whole week! 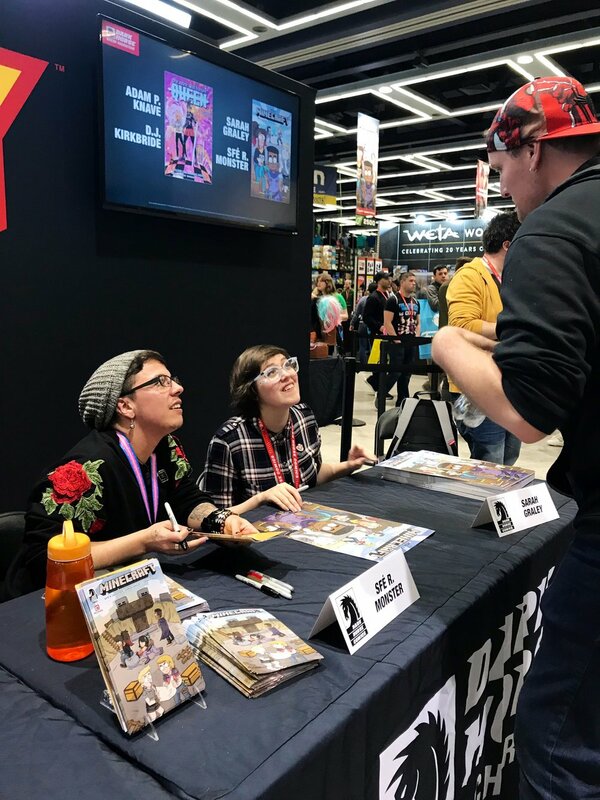 Me and Stef were visiting to attend Emerald City Comic Con for the second time and we had a pretty busy schedule of signings and panels that were all pretty wonderful! First things first though - tourist stuff! 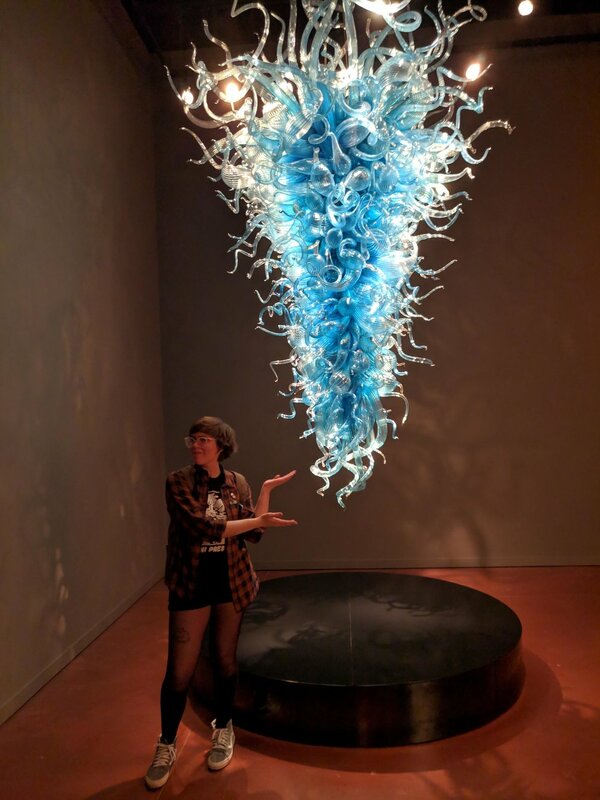 First up we visited the Chihuly Garden and Glass. 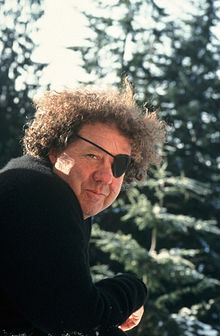 It’s full of these incredible glass sculptures imagined up by a guy called Dale Chihuly! We watched a bunch of short films about his creative process too, it was definitely worth a visit. The glasswork is incredible to look at, and they even do live glassblowing demonstrations outside as well! Next up, we finally went up the Space Needle! We wanted to go up the last time we visited Seattle, but it was sadly closed on our free days! 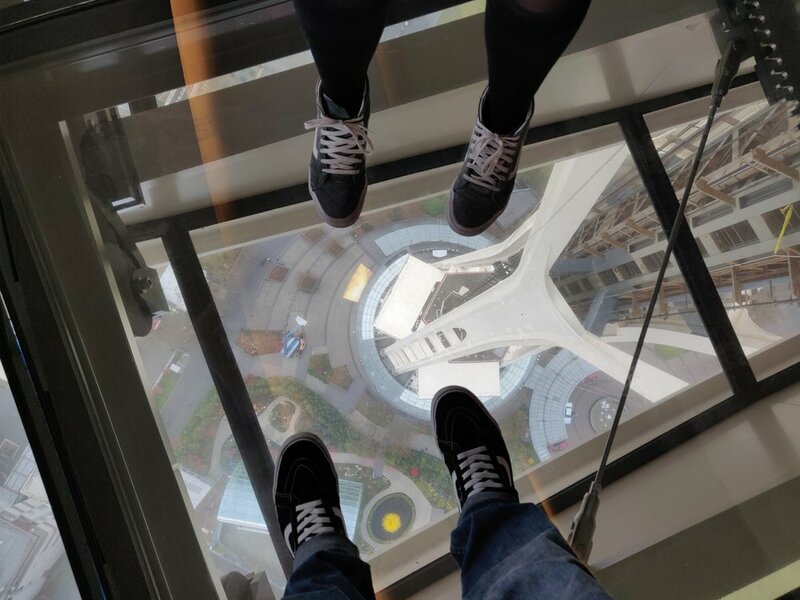 It lived up to the hype for sure though, and the glass floor bit is GOOD. 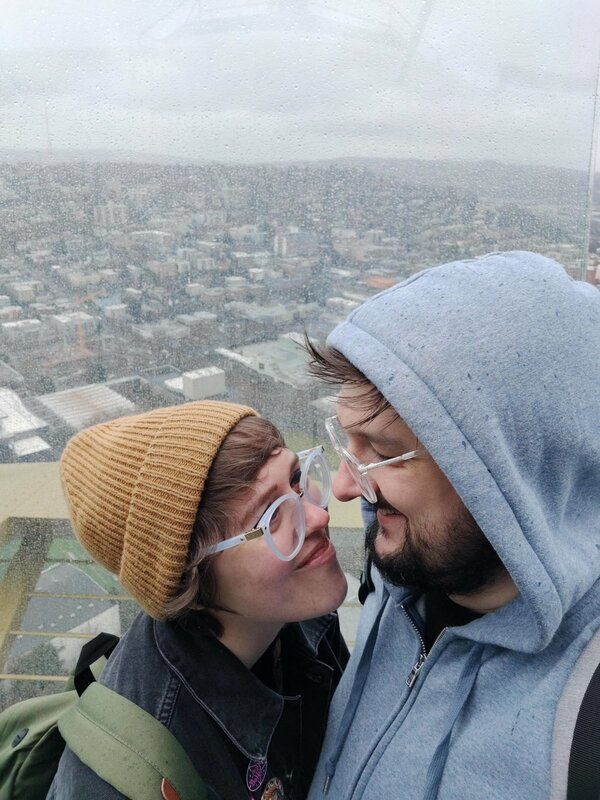 Funnily enough, we went up the Space Needle on the most overcast and wet day of the whole trip! The views were still pretty incredible though. The gift shop had some pretty great stuff too. 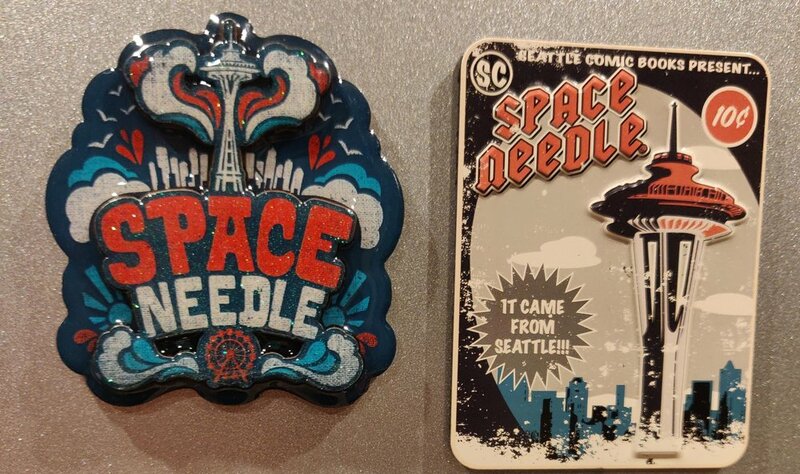 Stef has started collecting magnets from all of our trips, but his “one magnet per trip” rule got thrown out as he got two from the Space Needle shop alone! We went to collect our ECCC speaker passes first thing Wednesday, and we popped in to say hi to all of the Oni Press crew while they were setting up. This was the first time we saw this glorious roll banner! How cool is that?! 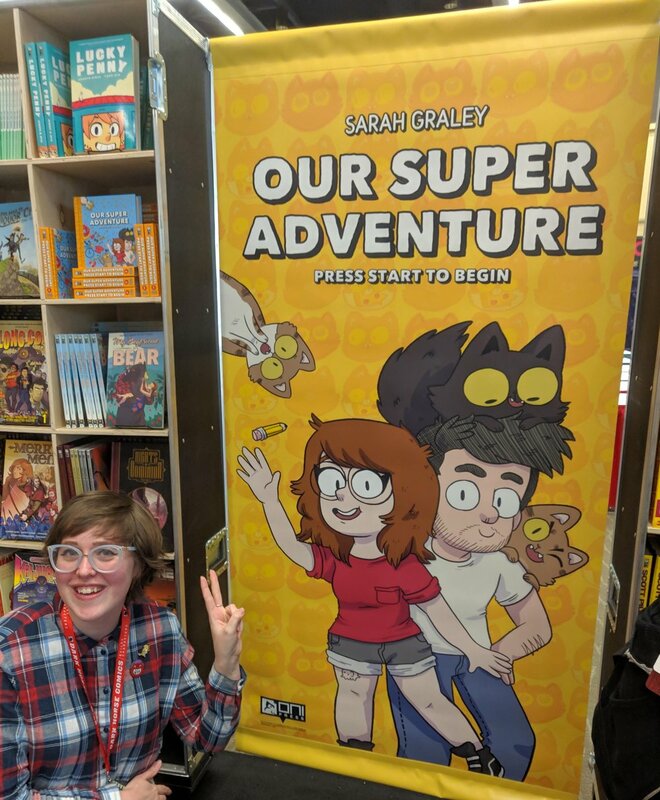 This was the first show that the new Oni Press edition of Our Super Adventure was available at too, which was really exciting! Once we finally ascended East Denny Way, we cooled off in Cal Anderson Park for a bit before the signing started! Thursday - ECCC Day 1! Day 1 of ECCC was good! 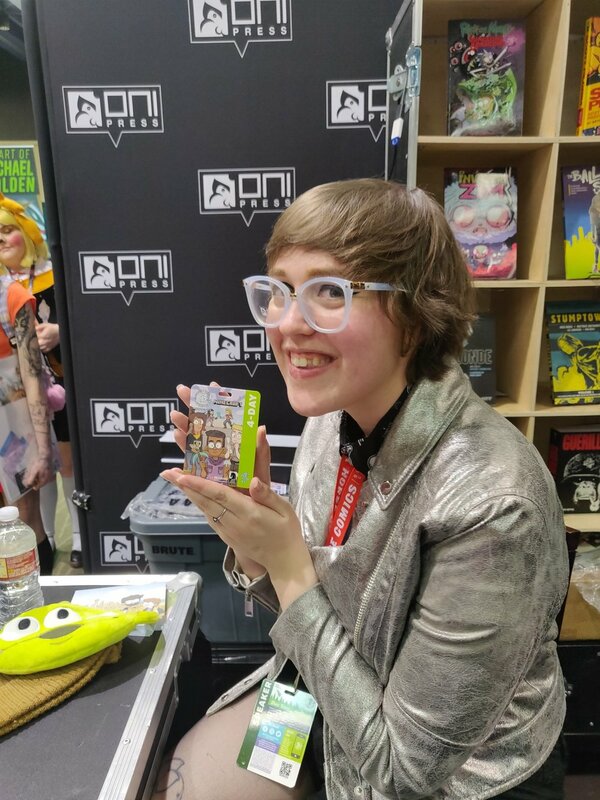 I had my first signing at the Oni Press booth (I did one each day of the show!) and my first few panels too! Panel no. 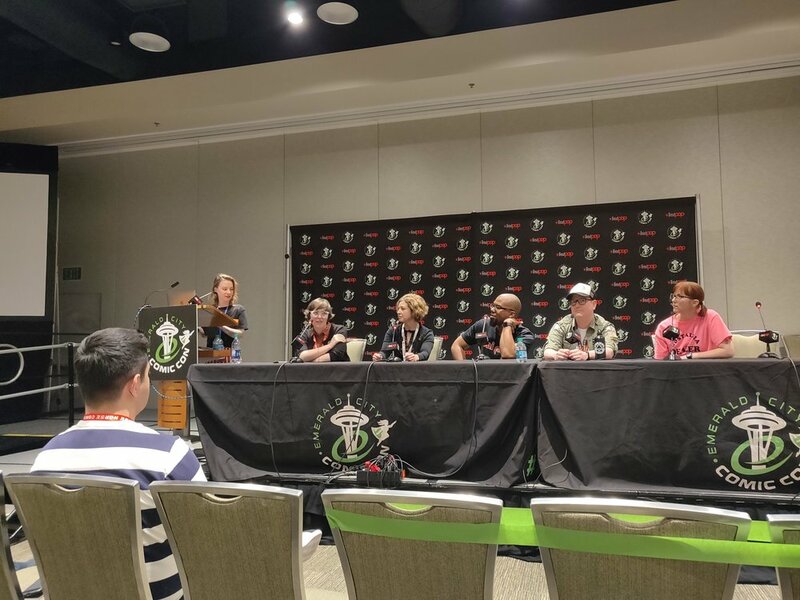 1 was “Marketing Your Own Comics Without Being A Nuisance”, and was moderated by Melissa Meszaros from Oni Press, and featured Cara O’Neil (Dark Horse Comic), Daniel Barnes (Black Mage), and Greg and Anne Smith (Junior Braves of the Apocalypse). We discussed different ways on how to use social media, and different cool ways of promoting your comics! Panel no. 2 was “Unicorns and Dragons Fly Onto The Classroom Bookshelf: Teaching With Fantasy Comics” over at the Seattle Public Library, and was moderated by Tracy Edmunds, and featured Michael Gianfrancesco (LitX, tryingteacher.com), Dana Simpson (Phoebe and her Unicorn) and Geoff Gerber (Anchorplate IP). 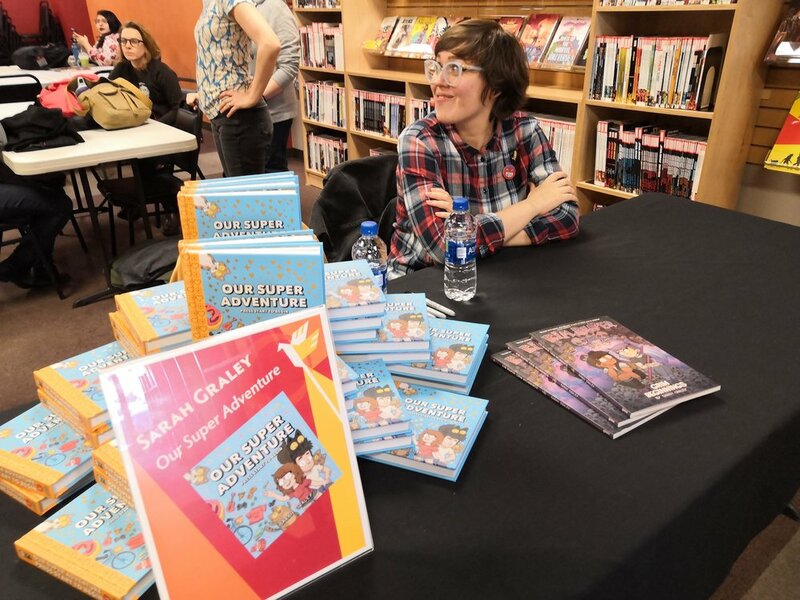 We all talked about our experiences with comics at a young age, and what we were enjoying seeing in comics now, as well as offering some recommendations for middle grade and young adult graphic novel libraries! There were also some advance copies of Glitch available at the library which was exciting - I’m really enjoying getting to see it start getting into the hands of readers! Friday - ECCC Day 2! We started Friday by hitting up Artist Alley to buy some cool things! 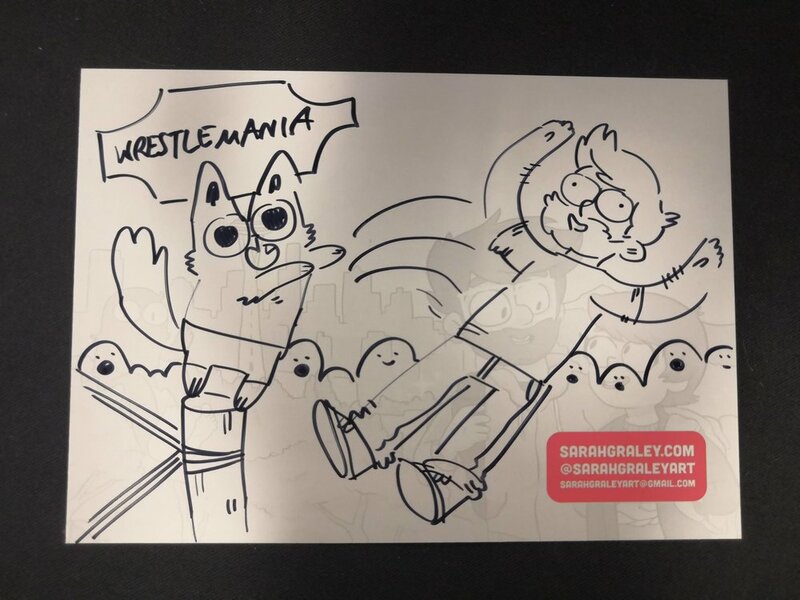 Artist Alley at ECCC is definitely one of the best - we can’t recommend it enough! We bought a few things from Tyson Hesse’s table, including some very good Sonic Mania keyring charms, and a Flicky enamel pin! I picked up Hannah Blumenreich’s new mini, Full Court Crush, and we also got a copy of the first issue of Kyle Starks and Erica Henderson’s new series, Assassin Nation! I also got a pin from Heikala and I picked up the first volume of Cucumber Quest from Gigi D.G.’s table too! 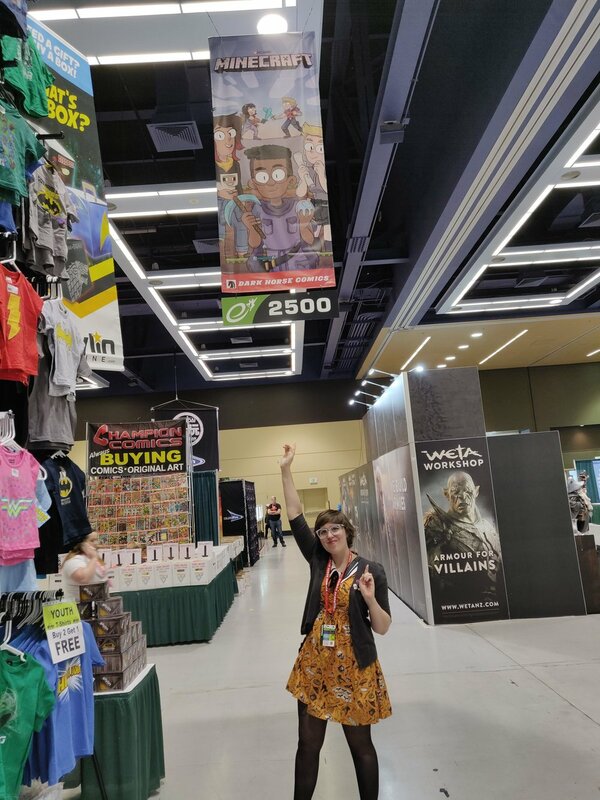 I also got to take a picture with one of the ECCC 4-day passes, which featured my cover artwork for the Minecraft graphic novel that I’m the artist on! This was super cool - I had no idea that they were using the artwork for the passes until someone tagged me in a photo of their pass on Instagram shortly before we flew out for the convention! It was incredibly surreal seeing so many people wearing the passes as we went around the show floor! We hit up a burger place called Lil’ Woody’s after the show, and Stef continued his streak of weird theme burgers from that place! Last year’s was a burger with doritos and “mountain dew mayo” - and this year it was a Hellboy-themed burger with flaming hot cheetos?!?! Saturday - ECCC Day 3! 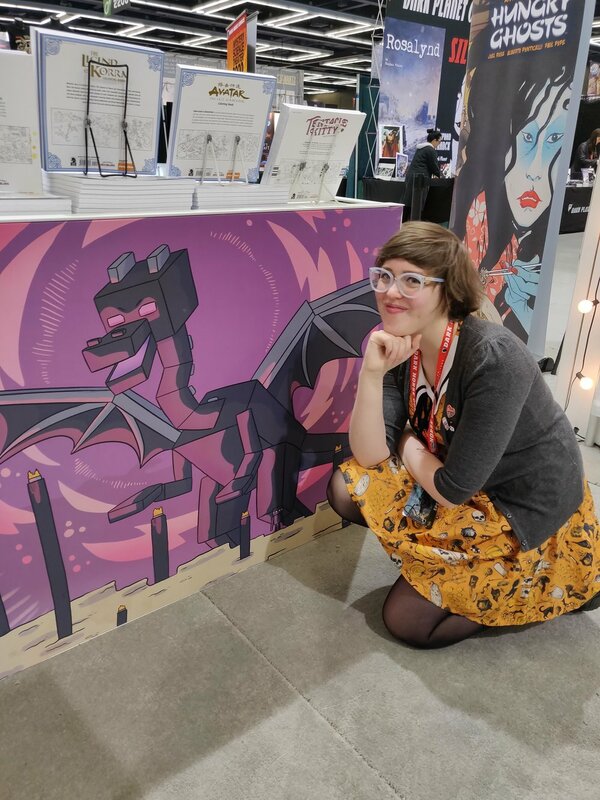 We got into the show a little bit early as I had a signing starting at 10am on the dot, and we took the opportunity to take some photos with some more bits of my art on the show floor! The Dark Horse booth had this ender dragon on one of their table edges! And this blown-up version of the Minecraft graphic novel cover was hanging from the ceiling a few rows down in the same hall! 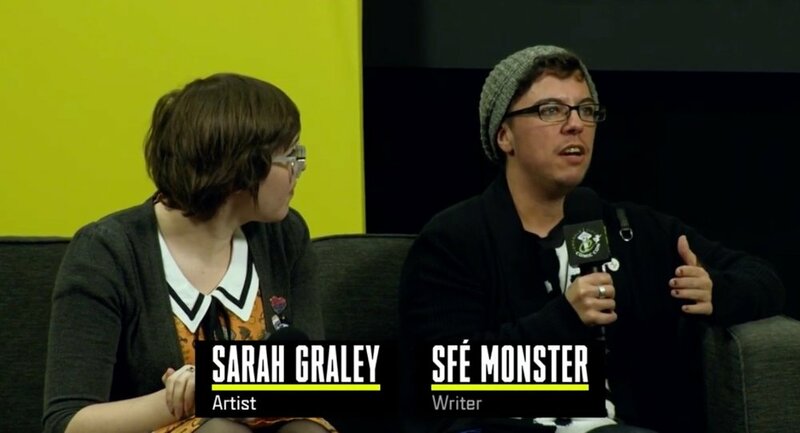 The interview went pretty well, and I got to talk about my love for Tetris 99 as well as Minecraft! Next was Stef’s first ever panel! 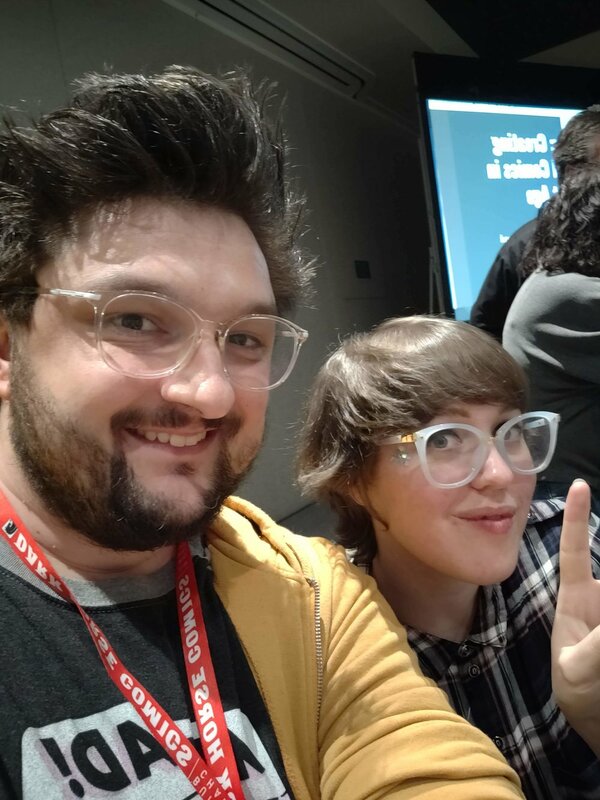 We both featured on the Tales from the Long Con panel where Dylan Meconis and Ben Coleman talked about their book The Long Con, and then us, Robin Herrera (Oni Press), D.J. Kirkland (Black Mage) and Ashley Poston (Geekerella) talked about some of our convention experiences! We talked a bit about the amount of toilets at UK shows (normally a good amount!) and the quality of folding chairs at UK shows (not that great!). We also all talked about cosplayers and how cool it is to see cosplay of one of your own characters! 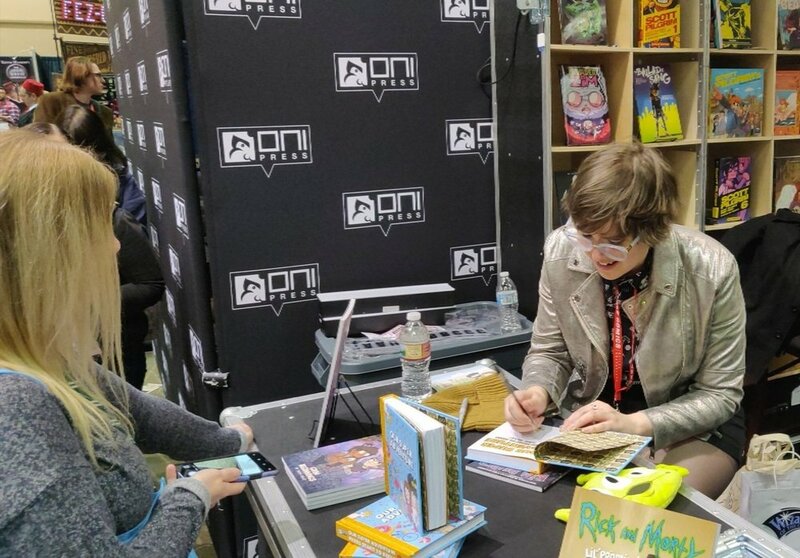 I then did a Glitch advance copy signing giveaway which went well, and that went nicely into my last panel of the day, Writing Graphic Novels for any Audience! This was moderated by Whitney Leopard (Penguin Random House), and featured Gale Galligan (The Babysitters Club Graphic Novels), Alison Wilgus (Chronin), Colleen AF Venable (Kiss Number 8), Judd Winick (Hilo), and Margaret Stohl (Life of Captain Marvel)! It was a really lovely discussion about comics and how a good comic is still a good comic no matter how old you are! Sunday - ECCC Day 4! That panel was called Be a Character: Creating Autobiographical Comics in the Internet Age! 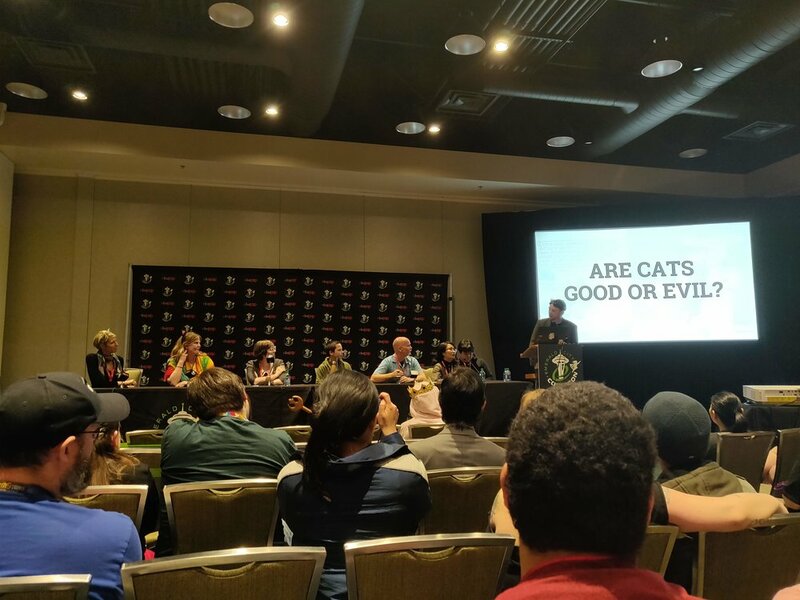 It was moderated by Ari Yarwood (Oni Press), and featured both myself and Stef, Abby Howard (Junior Scientist Power Hour), and Yuko Ota and Ananth Hirsh (Johnny Wander, Barbarous)! This was possibly our favourite panel of the weekend, we talked about different approaches to diary comics, and it was fun to talk about what we did the same, and what we did differently. 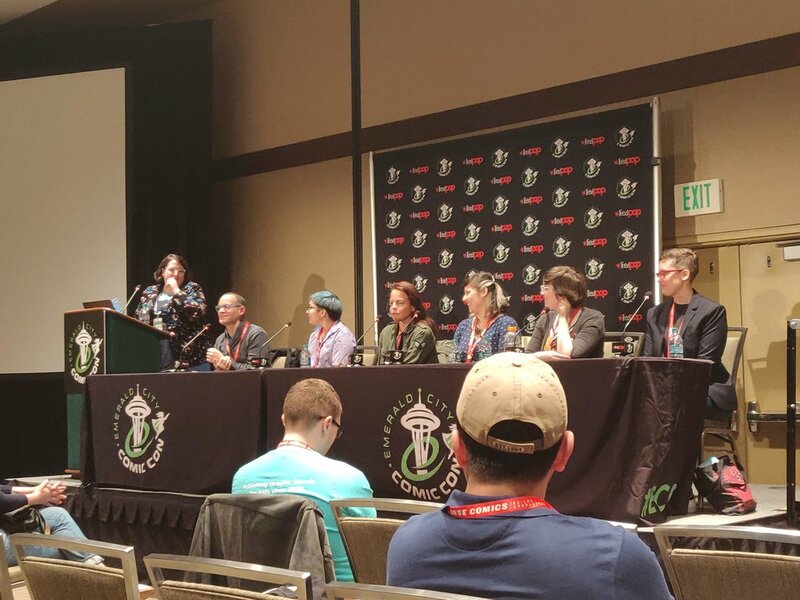 10/10 would panel again! Next up, I signed a bunch of Minecraft prints and preview comics with Sfé R. Monster over at the Dark Horse Comics booth! The Dark Horse Comics booth also had these cool tote bags for the show with a creeper that I drew on them! That was another surreal thing - seeing everyone carry these bags around was pretty great! Finally, our last panel was MONSTER BATTLE TIME KO! which was moderated by Robin Herrera (Oni Press) and featured three fearless teams - me and Stef (obviously), Yehudi Mercado (Sci-Fu) and Arielle Jovellanos (Fresh Romance), and Kimberli Johnson (Emiline Knight in Training) and Rin Howell (Calamity Kate)! We ended our show with one final signing at the Oni Press booth, which had a line going around the corner of the booth! All four of my signings at the Oni Press booth were really great, I’m happy that so many people came to say hi and to get books and comics! Our flight back wasn’t until the evening, so we spent the morning packing and checking out, and then we went for a walk to the Olympic Sculpture Park! The weather today was amazing! Considering that a week ago when we arrived the weather was almost freezing, today was such a nice warm spring day! So yeah! That was our Seattle ECCC visit this year! I want to say a huge thank you to Ari and everyone at the Oni Press booth, and Brett and Megan and everyone else at Dark Horse Comics too! 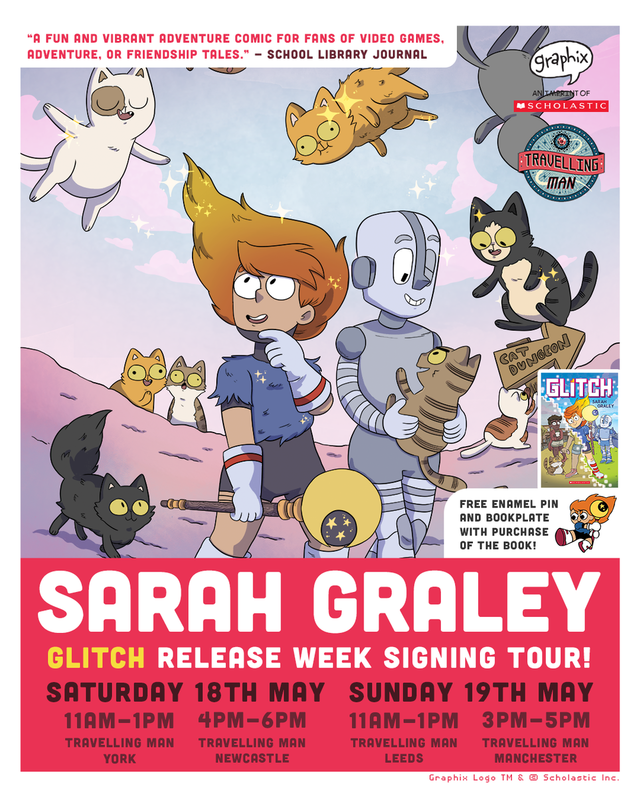 Also, thanks to Matt Poulter at Scholastic for helping organise the Glitch signing too!